Our firm offers transaction, regulation and dispute resolution services globally. Our lawyers are based in New York and Geneva. Our clients include governments, companies, investors and international organizations in Europe, the Americas, the Asia-Pacific region, the Middle East and Africa. We are known for our legal, regulatory and transactional expertise in the fields of information and communications technology, data protection and digital ID, digital financial services, utility projects and business diversification, international corporate and financial transactions, as well as dispute resolution. We are accustomed to interacting at the highest levels of government and business. We distinguish ourselves by combining rigorous analysis, a constructive attitude and respectfulness in crossing cultural boundaries. ▹ Jason Blechman was quoted as a legal expert on regulation of digital financial services in an article for the Mondato Insights blog. 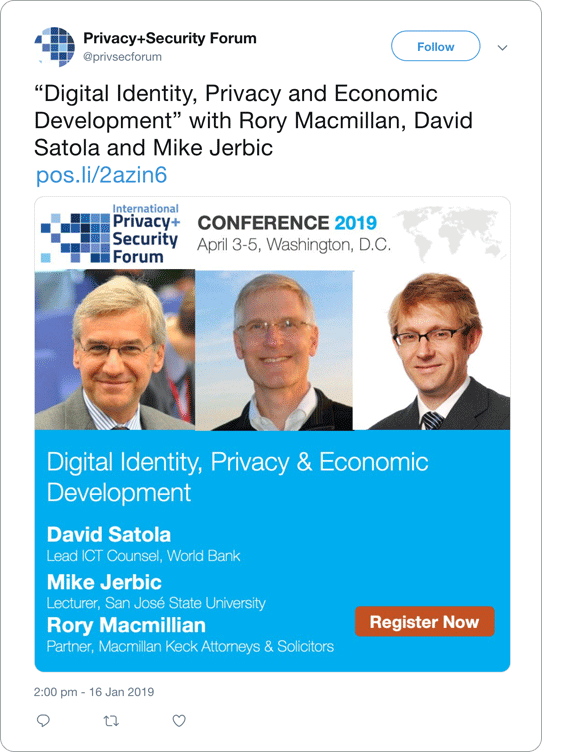 Privacy+Security Forum (@privsecforum) “Digital Identity, Privacy and Economic Development” with Rory Macmillan, David Satola and Mike Jerbic. ▹ Rory and Jason recently completed the ID Enabling Environment Assessment (IDEEA) for the World Bank. The IDEEA is a tool for assessing the readiness of developing countries’ legal and regulatory data protection frameworks for national digital ID programs. ▹ Rory is co-chairing the Trust workstream on New technologies and consumer risks of the Financial Inclusion Global Initiative (FIGI) (an initiative of the World Bank, ITU, Bill & Melinda Gates Foundation). He will present his paper on Big data, machine learning, consumer protection and data privacy to the FIGI 2019 Symposium. ▹ Rory and Jason recently visited Malaysia and Philippines to examine regulation of cross-border remittances, including digital wallet-to-wallet transfers, for CGAP (Consultative Group to Assist the Poor). ▹ Rory assisted the Expert Group of the Broadband Commission in reaching a consensus among telecom operators and OTTs and drafting regulatory policy recommendations for reaching the remaining 4 billion who still cannot access or do not use the internet. The report, A New Deal: Investing in our common future Policy recommendations to close the broadband gap, was released by the Broadband Commission at Mobile World Congress in Barcelona in February 2018.